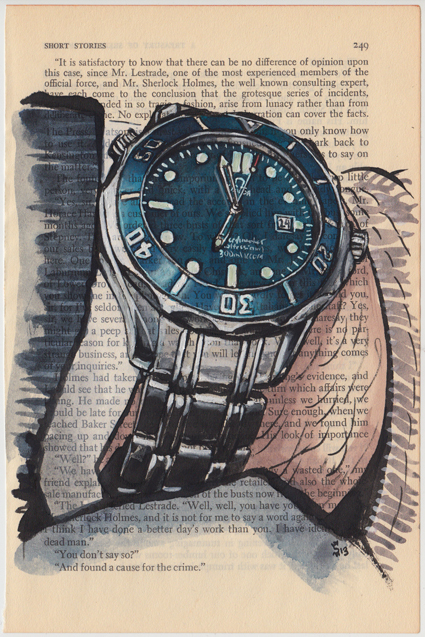 This Moda-Horlogerie style Omega Seamaster painting was commissioned by Nick. Nick wished to be identified only by his first name. This is what he had to say about his Omega Seamaster. 'My first foray into horology began when I was given a high-end Hublot counterfeit timepiece as a gift in college (gasp) and was told that even discerning individuals would not be able to tell the difference. This led to me various watch blogs and over time I came to appreciate what an art-form horology is and that in reality, any discerning person would immediately be able to tell the difference between a counterfeit and a legitimate timepiece if, save other tells, they were to look at the movement. I became fascinated with watch movements as I began to view horology as one of the last bastions of hand-crafted machinery that practically speaking, cannot be bested by fully automated production lines, nor should it be. As I continued to develop an appreciation for high-end watch movements I came across the Omega 8500 movement, which was built from the ground up around George Daniel's co-axial escapement. I began to fall in love with the intrinsic value of the fully in-house, utilitarian movement that in my mind, was an example of the culmination of hundreds of years of human innovation. After lusting after this watch for some time but never being able to afford it, I resolved to one day purchase it when I had "made it" in my respective industry. This day came much sooner than I had expected, and I wear the watch to remind myself to set goals, achieve them, and then to continue setting new ones. Here is a side by side of the Omega Seamaster and the Moda-Horlogerie Perpetual Moon it is modeled after. The Moda-Horlogerie style paintings are my favorite. There is more artistry in creating a scene and story than simply capturing the architecture of a watch. A watch, in my estimation is meant for its utility and everything else about it is developed to tell a story. Sign Up to get Watches Project updates. Thank you for joining Sunflowerman's Watches Project Team. This 1965 Omega Speedmaster 'Pre-Pro' watch was submitted by Balthasar de Pury (instagram user @balthasardepury). This Omega Speedmaster watch was submitted by Rick Kenner (instagram user @omegawatchdaily). This Omega Seamaster watch was submitted by Florian Pabel (instagram user @iflow3010). This Omega X-33 Mars watch was submitted by Rick Kenner (instagram user @omegawatchdaily). This Omega Speedmaster Professional watch was submitted by Maxime Humbert (instagram user @speedmaxter). This Omega Seamaster Diver ETNZ limited edition watch was submitted by Alex Chu (an old roommate of mine). He is always challenging me to work on the details.